Going on a trip and bringing a camera along? — Great! However, be sure to know what you can photograph at your destination without breaking the law. The short answer to what is legal, is: it very much depends. Disclaimer: The following isn't meant to replace professional legal advice. The information gives an overview of issues which may arise in connection with your photographic activity. In doubt, consult a lawyer. If you are a professional photographer or trying to establish yourself as one, protecting rights over your creative output should be of major concern to you. If it never appeared to you yet, the time is now. If you think about it, it is of the same significance for any copyright owner. If you think about it further, your photography can violate these rights, too. Sure, as a landscape photographer you are free to choose your subjects at will most of the time, that is, while staying on public ground and aiming your camera at the same. This changes when you enter a city. Within city limits, or in any populated area, you are surrounded by private property. Its legal owners also reserve the copyright, in general. Whether your photography infringes on it or not, is a matter of local laws in the country where you are. Some legal systems make exceptions for photography and other visual arts in their copyright laws. These exceptions allow, under certain conditions, replication of private property in works of art, including photographs. Exceptions can, in turn, be restricted and apply to certain kinds of subjects only, for example, buildings, making other subjects, like street art, fall under copyright again. Provisions limiting the copyright laws are known as Freedom of Panorama in English. The term is a literal translation from German, where it sounds just as awkward. German Empire was the first state to introduce the legislation allowing reproduction of plastic arts permanently stationed in public areas. This happened as early as 1876. In 1907, a reformed law became effective, which explicitly mentioned photographs of buildings and monuments in public places as exempt from copyright. In other countries, no such provisions are made, and photography, especially commercial photography, is subject to the same penalties as other copyright infringement practices. The colours on both maps are not exactly the same, but you can easily match them. Mexico on the world map is "Maybe OK, unclear", so should actually be grey. 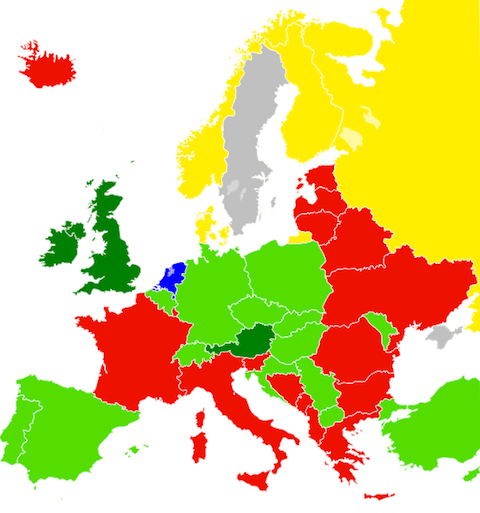 The full colour palette in use by the European Union may cause surprise, but its member states rarely disagree on something more than they do on copyright. In fact, young Members of European Parliament tried to harmonise Freedom of Panorama provisions across the Union. The idea was to make liberal legislation common sense. It turned out differently. The working group ended up with a bill requiring "green" countries turn red instead. The Parliament did well, though, and turned the motion down (for now). 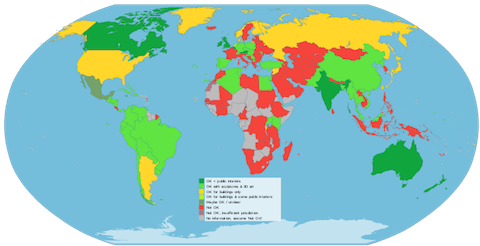 Dark green countries are most liberal. You can usually take pictures of everything in public places and public interiors. In Austria, you can photograph all objects standing in public even from private ground, for example, from a hotel room or an apartment. Some restrictions may still apply for street art, paintings, books, etc. Light green means OK to photograph buildings, monuments, sculptures, or the like, which are permanently installed in outdoor public areas. Objects of art placed, say, in a park during a temporary exhibition, are usually off-limits. Yellow countries allow you to photograph buildings only. Monuments and sculptures are subject to usual local copyright laws. United States define "buildings" only as such; bridges, damns, interchanges, and intersections fall under copyright protection. A quick look on the maps will give you an answer what you can expect to be able to photograph at your destination. However, this is only one part of the story. Even in "green" countries – or especially in those – mind anti-terror measures as well. Choose your motifs with due sensibility. You don't want to be accused on these grounds. There is at least one more variable in the equation: the laws of your own country of residence. You can be held liable according to them, if they happen to be stricter than those where you took your photographs. The German Federal Court of Justice decided in 2003 against the legality of selling prints made from photographs taken in Vienna, Austria. The images of a building by the Austrian architect Friedensreich Hundertwasser were taken without his permission from a private apartment in an opposite building. Though in accordance with "dark green" Austrian law, they were against the "light green" German provisions. The business group trying to sell the prints was successfully sued at the location of its headquarters in Germany. To make it even more complicated, if the copyright owner is from a third country, its legislation is also to be taken into account. Oh, and don't forget: if you publish someone else's photographs on your web site or blog, you are still liable in case the images infringe any copyright. Now, what to photograph in Paris? Another good question! This is a kind of research you should make before a visit to any "restricted area". 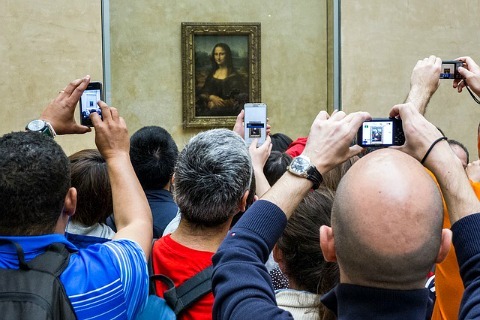 According to French law, only images of buildings and works of sculpture taken by individuals without commercial intent in public areas, are exempt from copyright. Street art and exhibition objects are, on the other hand, not. Eiffel Tower is a notable exception, since Gustave Eiffel yielded his copyright to public domain. SETE, the organisation in charge of the monument, still claims copyright for images of illuminated Tower in France and several other countries. Ask for permission. This is the surest way to stay legal. Use wide shots. Even the most forbidden features become less prominent when looked at from a distance. Pretend your image is about something else. Compose it in such a way that changes its subject, moves it in the background, out of focus, or in part out of frame. Photograph a reflection instead. Make the real thing recognisable, but not obvious. 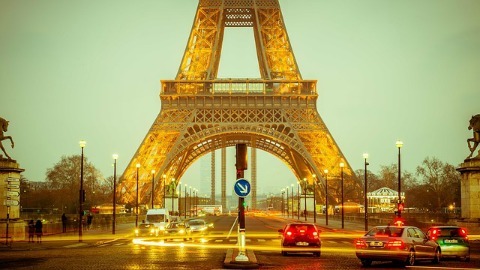 France is just an example, being one of the most popular tourist destinations in Europe. Italy is another one where you should pay attention. "Pay" seems the right word to use in this context. Unattributed images on this page are sourced from Pixabay and Wikimedia Commons.